Scientific Crop Agronomy, Inc. has been utilizing the Nano Brown Sugar product produced by Nano Ag Technologies now for three years to promote even emergence and early plant vigor of both corn and soybeans. We have recommended this product to several growers in our area (as well as on my own farm) each year with profitable results. Normally we recommend a split application in which we place 16 ounces in our liquid pop-up fertilizer program and 16 ounces tank mixed with our final post emergent herbicide and/or foliar fertilizer application. In these cases, we have increased our germination to emergence time interval (resulting in a more even emergence) as well as maximized our early plant health in both crops. In my opinion using, Nano Brown Sugar as part of your fertilizer/plant nutrition program is a must. Due to its “Nano” chemistry, the return on investment is better than any other sugar products on the market we have tested. This past summer we tested Nano Brown Sugar on late summer control aid for Western Bean Cutworm in corn. Due to the increased pressure and overall numbers of this insect pest this year, some fields couldn’t be treated in a timely manner. Once Western Bean Cutworm larvae move into the corn silks they are next to impossible to control. We at Scientific Crop Agronomy recommended close to 75% of our corn fields to be treated last summer for WBC. In cases where the WBC migrated from the tassel to the silks by the time the field was to be treated, we tank mixed Nano Brown Sugar with our insecticide of choice based of the recommendation of our Nano Representative. We had several growers with moderate to heavy infestations of WBC with 75-80% of the WBC larvae in the silk tips at the time of application. Normally you would expect a 50% control of WBC larvae at this threshold at best. When the Nano Brown Sugar was tank mixed in these situations, we were observing close to 80-85% control of the larvae in the silks. On the fields that were treated normally without the tank mix of Nano Brown Sugar, the control fell under 50% and noticeable ear feeding later in the growing season. Overall we have been thoroughly impressed and validated by using Nano Brown Sugar produced by Nano Ag Technologies as part of our crop protection arsenal. Background - Scientific Crop Agronomy, Inc. has been heavily involved in the agronomy service industry for over 15 years in central Nebraska. We pride ourselves in discovering, testing and applying safe and economic ways to promote soil/plant health and bringing proven products/practices to mainstream agriculture. We have successfully improved yields and increased soil health with countless customers over thousands of acres with both products and practices we have tested over the years. 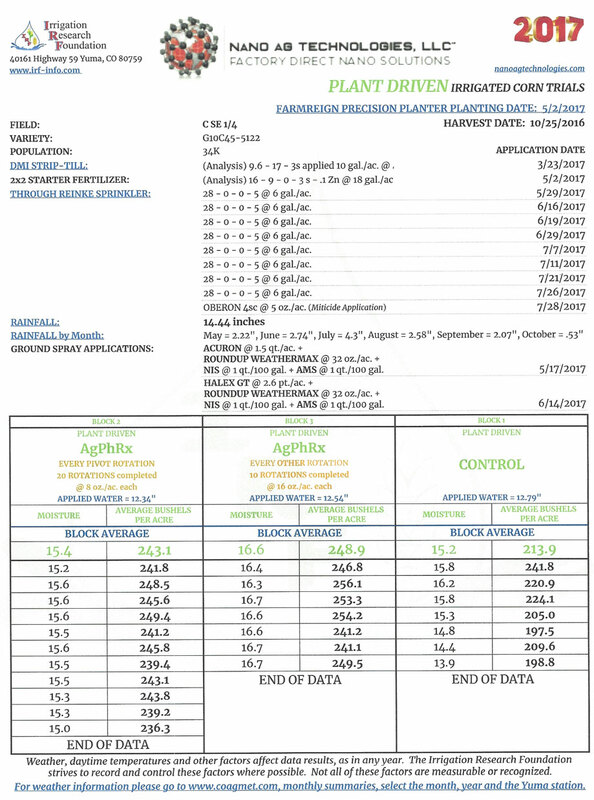 The Goal of the Test - Our goal with this test was to see if there were any significant benefits of applying AgPhRx through the center pivot irrigation system. This test would focus on two crops; corn and soybeans. As agronomists we were looking for agronomic benefits including (but not limited to) the following: plant vigor, canopy height/coverage, mid to late season plant health, grain quality and overall yield throughout the growing season. We would then compare the findings and results with the control area. 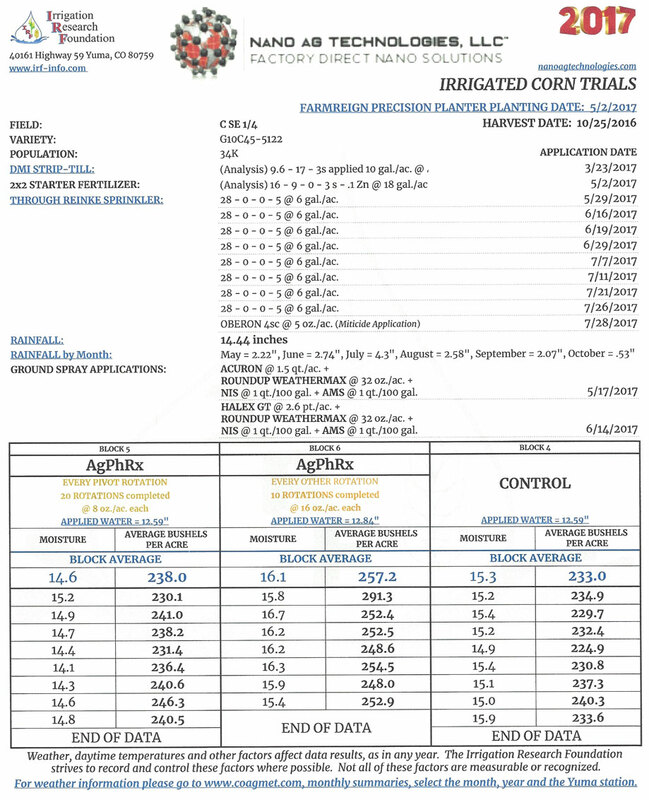 Test Protocol - We recommended 16 ounce passes three times throughout the growing season at particular growth stages of both the corn and soybeans. On the corn we applied the first pass at V7 (7-Leaf), second at V18 (Pre-Tassel), and the final pass at R2 (Mid-Milk). On the soybeans we applied the first pass at V3 (3-Trifoliolate), second at R1 (Flower), and the final pass at R3 (Early Pod). In total we used 48 ounces of AgPhRx per acre on both the corn and soybeans. The control area that we selected was a “pie-shaped” flagged area on the corn soybean border. We shut the injection pump down between the flags on every pass of AgPhRx. Corn - Overall plant health (especially after the second pass of AgPhRx) began to separate out shortly after full canopy though V16. The plant height of the treated areas were an average of 6-8” taller at beginning tassel than the control. Also the plant color/health was noticeably better in the acres with the full rate of AgPhRx. The corn yielded on average 10.74 bushel better than the corn in the control area over the scale. The ears seemed to be retained better on the treated areas with the late October winds vs. the control. We did not observe any noticeable difference in grain quality. Soybeans - There was no true height separation on the soybeans throughout the growing season, but the difference truly showed up on the canopy closure (due to the increased leaf diameter). The 20” rows canopied 5 days sooner than the control. 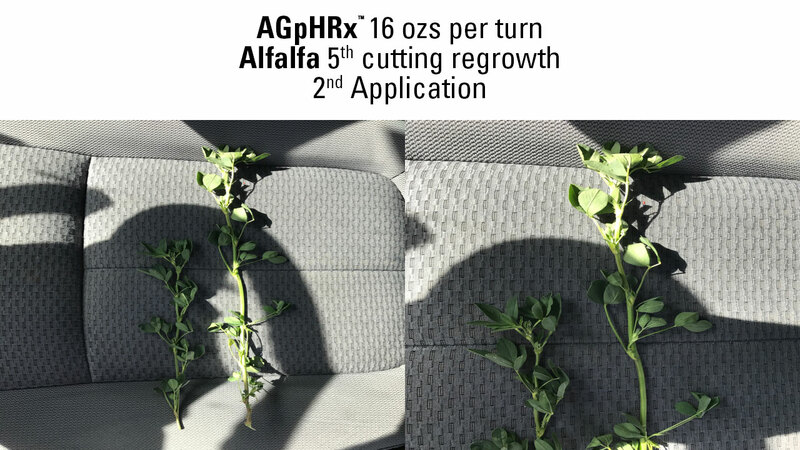 The plant color/health was slightly better in the acres with the full rate of AgPhRx. The soybeans yielded on average 9.74 bushel better than the soybeans in the control area. 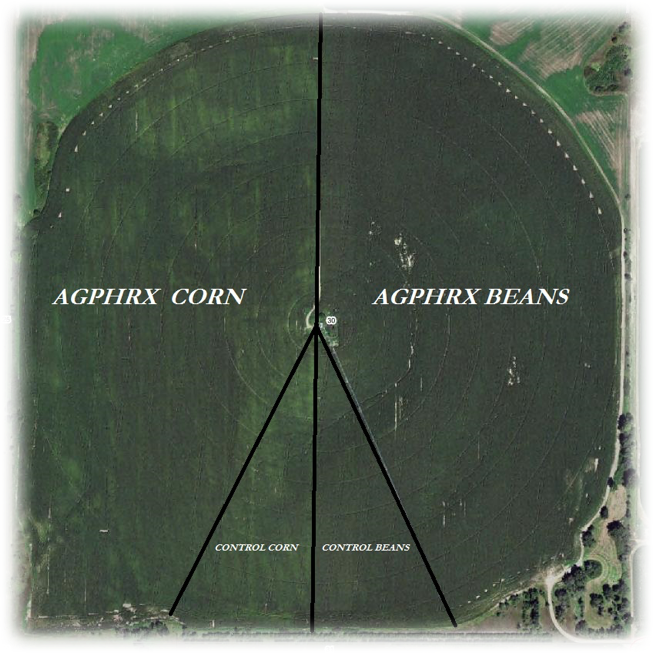 Overall we would defiantly recommend and encourage the use of AgPhRx in any situation where ground or surface water is the carrier for corn and soybeans.